Newly built, this romantic luxury villa sits on a ridge with every room overlooking amazing views of water, bush and city lights. Decorated throughout with enchanting French decor, it exudes an atmosphere of charm and tranquility. A romantic setting for one or two couples; a family get away; an amazing homey-moon or mini-moon location; or for that special pre-wedding night with the bridesmaids, hair, makeup and photos on the day of the wedding and returning that night as 'Mr and Mrs' - this beautiful villa ticks all the boxes. Champagne and roses can greet your arrival. Snuggle up on the gorgeous couches in front of the cosy fire place, dim the lights, light the candles and enjoy the city night views. Both bedrooms have their own en suite with double shower and double bath. Sink into the pure luxury of a lavender scented bubble bath for two as you soak in the wide open views. Plush bath robes and fluffy luxury towels are provided along with locally made organic lavender and rose soaps, body wash and bubble bath. Sumptuous king beds with crisp high quality linen ensures a deep restful night's sleep. Awake to the morning chorus of birds singing whilst overlooking the picturesque views. Enjoy the provided, self cooked breakfast which consists of free range bacon and eggs, local yogurt, and musile along with bread, jam along with an assortment of beverages. Breakfast is provided for the first two mornings of your stay. The beautiful country kitchen is fully equipped and overlooks the gardens one way and amazing views the other. French doors open out from the dining area on to the patio furnished with table and chairs, barbeque and sun umbrella. No matter what the time of year Longview Villa offers a perfect romantic getaway for two or a charming place to stay for four. Venture out to explore the beautiful local beaches/pubs, restaurants in abundance, local mall and movie theatre only 5 to 10 minutes drive away. 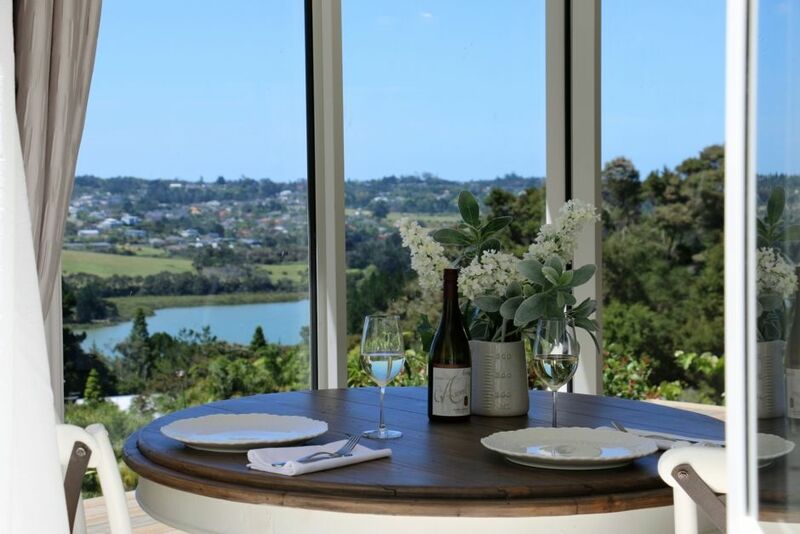 It is a short 15 to 20 minutes to the white sand East Coast beaches, 30 minutes to the West Coast surf beaches (including the Muriwai Gannet colony) and 40 minutes to the beautiful Warkworth / Matakana area with its rural scenery, vineyards and well known wine trails. If booking for 2 people one bedroom and bathroom will be locked. If you do want both bedrooms and bathrooms (for 2 people) please place a 3 person booking and advise us by email. The guest reviews say it for us. Whether you are after romance, relaxation, a short family get away (or longer), or to feel special this property ticks the boxes. The peaceful surroundings and being away from the city but only 5 minutes drive from one of Auckland's biggest malls. Lot's of restaurants, bars and fast food outlets just a short drive away The decor and finishing touches to the villa make it a very special place to stay. Luxurious linen, sumptuous double bath and double shower, cozy gas fire, and on and on the list goes! toilet, tub, shower, Luxurious and private view from the double bath! Longview Villa is less that half an hour drive to Orewa beach on the East Coast or Murawai beach on the West coast. This property looks over the rural and bush foreground view toward the distant North Shore suburbs. A peaceful view in the day and the lights are very special at night. Albany Village is only 5 minutes away with its many restaurants and fast food outlets. Across the valley is the lovely 'green' view of the North Shore Golf club. Rangitoto is off in the distance. Snow planet is just up the road for indoor skiing. A peaceful view over the bush to the river below. A coffee plunger is provided. We provide bacon, eggs, muesli milk, yogurt, bread, butter, jam, tea and coffee for you to prepare yourselves for the first two breakfasts of your stay. A classic full kitchen is yours to enjoy. This is a stand alone cottage so you aren't sharing the kitchen with anyone else. One in the main living area and one in each bedroom. Attractive gardens enhance your overall experience of Longview Villa. A deck overlooking the view and also two patio areas so you can optimize your experience depending on the time of day. I got ready for my wedding here and what a magical spot it was! The villa was beautiful and just the perfect spot for some very special photos. The house was excellent, very clean and had alot of extras. I would definitely stay there again. The house was very tastefully decorated, nice and clean, the owner was very friendly and welcoming and he provided some treats for weary visitors. Beautiful, extremely well presented. Every room was a delight to be in. Thanks for staying and you will be most welcome back again. Wonderful guests and we recommend you to others. Lovely place with stunning surrounds. We had a very relaxing stay. Wonderful guests who left the place in great order and we would love to have them stay again. An excellent property to feel at home in. Comfortable bed, great bath with great water pressure in the shower. So many thoughtful touches from the owners. 5 Stars for sure! Loved it. Great guests to have stay. They were quiet, respectful and appreciative of the character of the villa and left it clean and tidy. Thanks. Longview Villa was the perfect place to call home for our 5 day visit to Auckland. It was wonderful to enjoy the quiet countryside while only being 20 minutes from the city. The Villa with its beautiful gardens, tastefully appointed interior and amazing views surpassed all expectations. Paul and Lynette, our gracious hosts, provided luxury amenities as well as tasty breakfast items. Longview Villa is a great value, and highly recommended. The main attraction about Longview Villa is the peaceful surroundings. Guests love the peace, the native birds, the bush, the stunning view and many say they cancel their 'tourist' plans to just stay, relax and refresh at the villa.